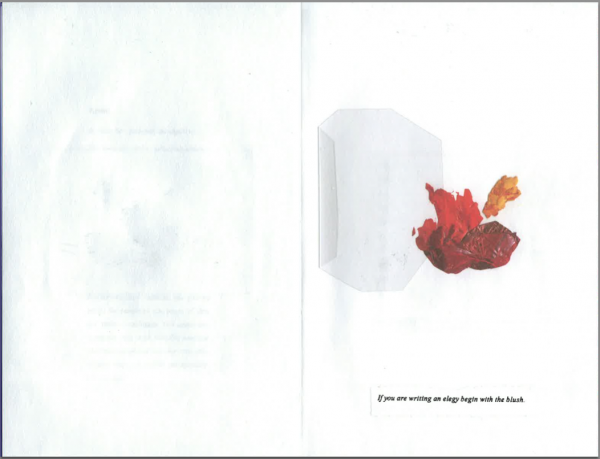 This is a very unusual book: physically unusual (it’s an accordion book in a box), with an unusual collection of texts and images, and, I think, a nearly unaccountable psychology. I will comment on each of these in turn, with special attention to places where those issues impinge on how the writing works with, and as, images. Every third or fourth page in this book is a dictionary entry for a single Latin word, and the words follow the order of a Latin poem with which Carson opens the book. She explains why she has begun with this poem more than halfway through the book (in § 7.1), and one of her attempts at translating the poem is finally given two-thirds of the way through (after § 7.2; reproduced above). 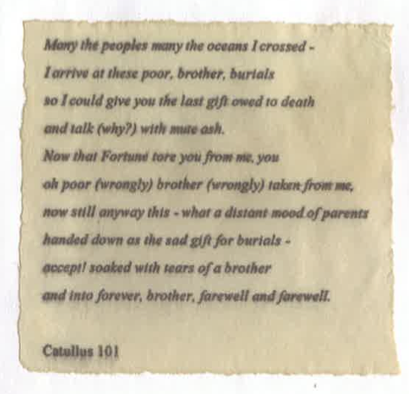 It is a poem by Catullus about the death of his brother, and the book is a meditation on the death of Carson’s brother. These questions of content and pacing are pertinent because there are several ways of reading the book. Most readers, I think, will dip into the dictionary definitions, but read the other entries carefully. (The other entries are brief, and if you skip the dictionary definitions, the entire book can be read through in 20 minutes.) If you stop to read each dictionary definition, Carson’s narrative is interrupted and slowed tremendously, and reading becomes a matter of continuously divided attention. The definitions are not appropriated text: they are either entirely written by Carson, or selected and arranged. A student pointed out to me that many of the dictionary entries end with especially dark images, so there is a rhythm of mourning on most dictionary-entry pages. Reading the entire of Nox including all the dictionary entries would therefore be a matter of moving repeatedly from dense philological and etymological information, soaked in immanent mourning, to blank or nearly blank pages with stories, letters, and photographs. Reading a draft of this, Dionea Watt suggested that Carson “did not intend the reader to know how to experience the oscillation, but to feel it—to be thrown about, without knowing (where does the desire to know come from? ).” Watt related that to the “sparse nature of the book… and the impoverishment caused by loss itself. The world for the bereaved becomes poor; language is excessive yet insufficient.” This sounds right to me, although I still wonder if Carson was thinking of the particular kind of disorientation produced by not knowing how to read the dictionary entries, or how much expressive content is intended to come from them, or what the experience of that “oscillation” might be like for a reader who is given, repeatedly, no clues about how the experience creates meaning or re-enacts loss, or even whether the oscillation is intended to be experienced at all. The “percussive” effect (to adopt Elaine Scarry’s expression from The Body in Pain) of taking alternating doses of Latin grammar and heartfelt memoir is clear, but for all that readers know, from Carson’s viewpoint it might not be painful or disorienting—it might be nourishing or recuperative. 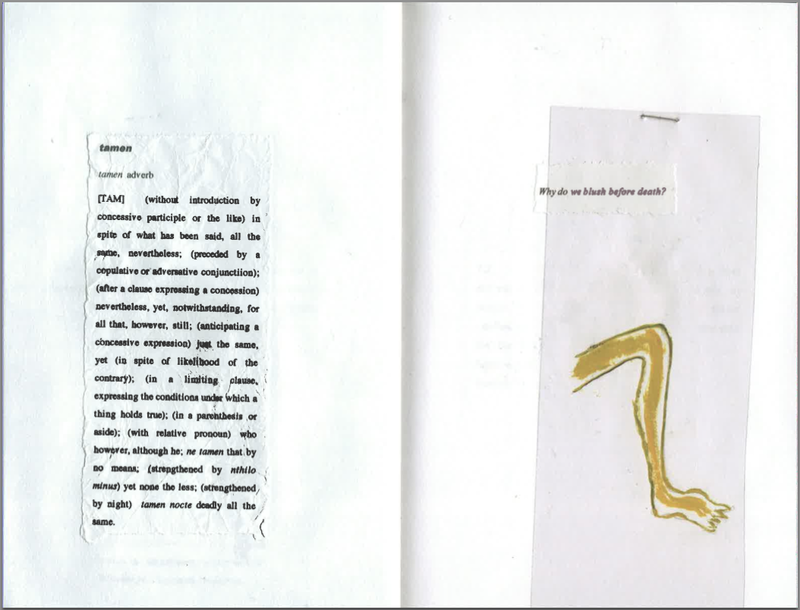 These questions bear on how the images are encountered. A slow, deliberate, thorough reading may also be a reading more likely to pause and ponder the pages with images. On the other hand, images provide, as always, their own forms of interruption, so that a quicker reading, which only samples the dictionary definitions, might be more likely to find the opacity of the images expressive. This is an accordion book, a format with various associations: it was used by modernists (including Sonia Delaunay’s “La prose du Transsiberien”) and in the nineteenth century (by George Cruikshank). (Thanks to Margaret MacNamidhe for those references.) For Carson, I’m assuming, the format also has resonance with ancient, perhaps Roman, ways of storing books—or perhaps the reference is to more recent Japanese and Chinese examples. It’s a conundrum, and it would be nice to know what was intended. 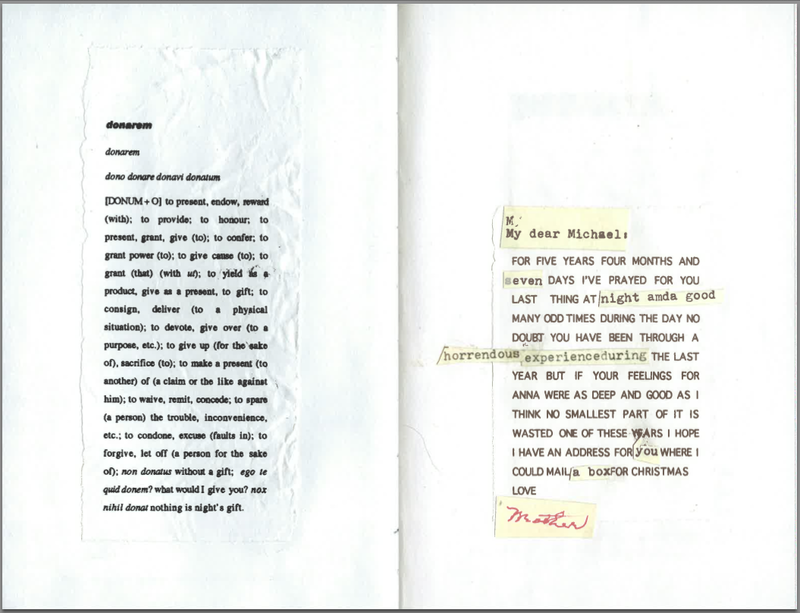 A short note on the back of the box that holds the accordion book says it is a replica, “as close as we could get,” to the original book, and there’s an interview in which Carson and the designer talk about the original book. 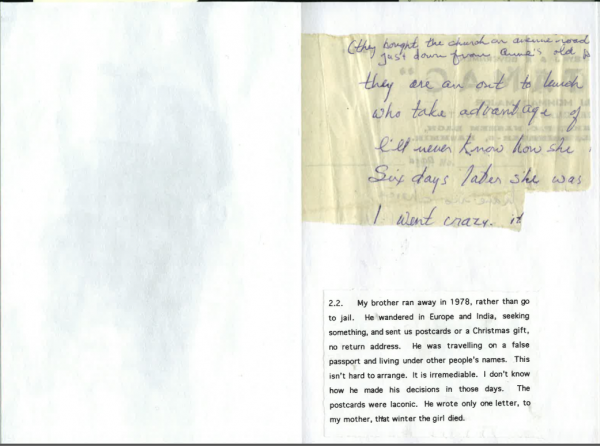 Throughout the printed book it is possible to see the marks of sewn signatures in the fold (the accordion book is glued, not sewn), so it’s clear the original was bound in the traditional way. That makes it odder that Nox is printed accordion style, because that must surely be more expensive than a simple, or even a sewn, binding. On the other hand, there is some evidence that these are not full pages, and that this might not faithfully represent its original: Carson does’t let us see the top, bottom, or outside margin (fore-edge), which makes it likely that the original pages were slightly higher and wider than the ones in the book. There is nothing in the book’s presentation that explains this, given that all sorts of flaws, rips, cuts, and stains are present: why couldn’t the top, bottom, and outside edges also show? I mention this because the precedents for careful color reproductions of manuscripts, including dog-ears, marginalia, and always including the full folio pages, are the many expensive, limited-edition color facsimiles of precious manuscripts such as the Très riche heures or Jung’s Red Book. For me those kinds of reference open, again, the question of preciousness. 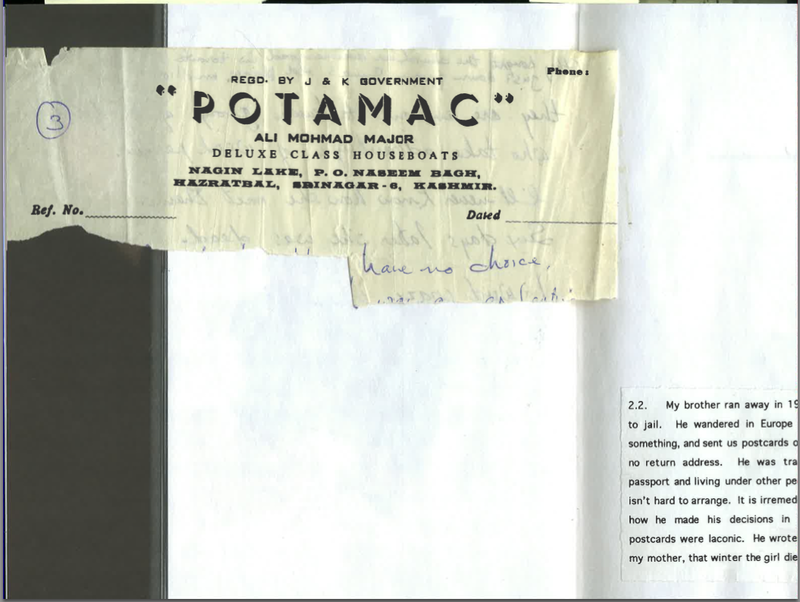 Before I pursue that theme, there is also a curious detail that’s pertinent here: a hand-written letter is reproduced in part, and then the reproduction is repeated, and repeated again, in a different arrangement. (Images below.) Clearly it’s only one letter. So if Nox reproduces a book that actually exists, is the letter in that book in the form of three copies of a color scan? Or is Nox a reproduction of a book that does not contain that letter, and those copies were added for the purposes of publication? The fact that this anomaly exists is evidence, for me, that Carson did not think readers would think about reproductions and originals in too much detail. Her main concern in those pages was reproducing the stuttering, hallucinatory effect of powerful emotions (notice the printed text numbered “2.2.” also repeats) and the pages work well in that regard. But the papers numbered “2.2” are computer printouts, and could have been repeated in the original book: the repetition of the unique letter also means I am asked not to consider the original book or questions of reproduction. This may seem like a pedantic objection: but it is a sign of one of the limits of the book’s meaning, and for me it’s significant that Carson does not think about these things. 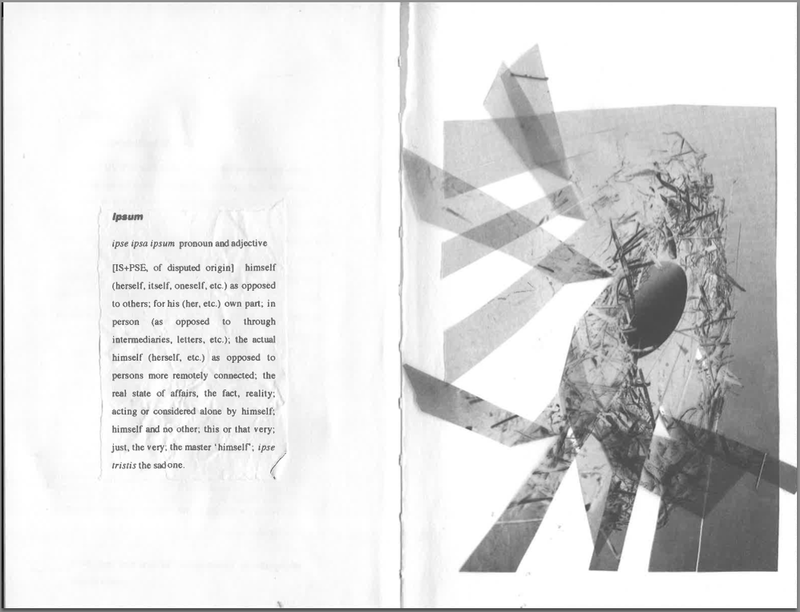 She has printed these texts, then crumpled them, then pressed them flat. Some are even ripped—and yet they are clearly only Xerox copies of computer printouts. There is a lot of intentional “antiquing,” exactly as in the antique furniture trade, intended, I assume, to make everything in the book seem precious and possibly unique. 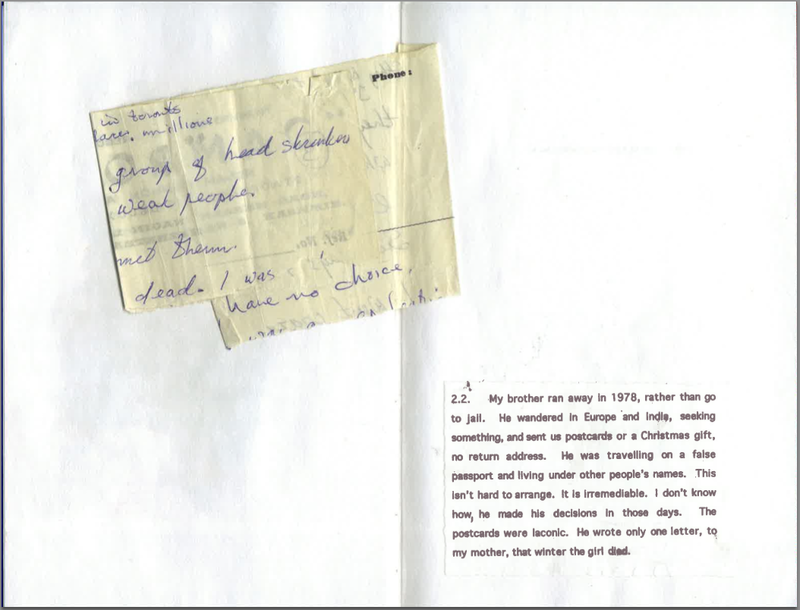 That intention is strangely undermined when the objects are so ordinary (like computer printouts), and it’s even stranger when, in a few places in the book, things that are clearly unique (like a precious handwritten letter from her brother) appear several times, in slightly different states. A different but parallel question arises about the texts that are not dictionary entries. Some are presented as collages (as on the right in the reproductions above and below). It seems clear to me that we are not invited to think about Carson printing out pages and crumpling them systematically to make them look distressed. Her purpose in doing that would presumable have been to turn them into signifiers of her mourning, but it would undermine that effect if we were asked to picture her standing over the printer or scanner, crumpling sheets of paper. I think it would be especially hard to imagine her (or, to put it more exactly, to imagine the narrator) making little collages of words and pasting them together, unless, again, the purpose is to turn them into signifiers of her mourning. Collaging and crumpling and scanning are all deliberate, or worse, they’re strategic and manipulative: they aren’t compatible with the strong, honest, emotional narrative of her brother’s death. Again my reservation comes from the lack of any sense that the author is aware of the possibility that readers might raise these questions, rather than just taking the images, collages, and other forms as general, holistic signs of mourning. Crumpling, collaging, and scanning don’t seem to work this way: there isn’t a logic to them, and I think we are just supposed to take them as general signs of grief. The principal formal question raised by images in this book is preciousness. 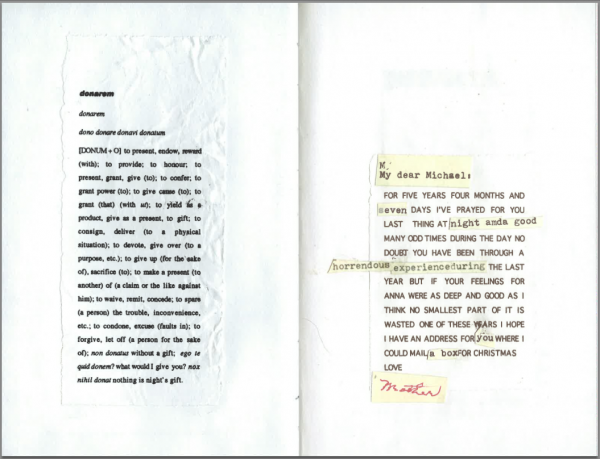 All of the objects in the book, including the least interesting and most obviously reproduced Xeroxes and laser or inkjet printouts, are treated so they appear to have been repeatedly handled, cared for, conserved over years or decades, even cried over. One one level the distressing or antiquing is a general sign of affect. One text among many here is Roland Barthes’s Camera Lucida, which describes the “winter garden photograph” in these terms. “The corners were blunted from having been pasted into an album,” he says. “The sepia print had faded, and the picture just managed to show two children standing together at the end of a little wooden bridge in a glassed-in conservatory.” The over-read punctum, the identification of a reproduced and reproducible image with the unique loss of a person, and the pathetic fallacy linking affect and an object’s physical condition can all be read in Nox. Aside from the affective content of objects in this book, preciousness remains a general problem for writing with images. 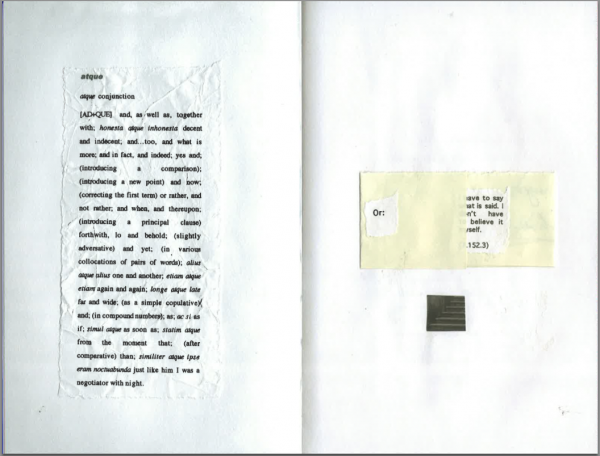 In this case, as soon as images (including texts) are represented as physical objects, with signs of age, they become objects whose material states influence their meaning. 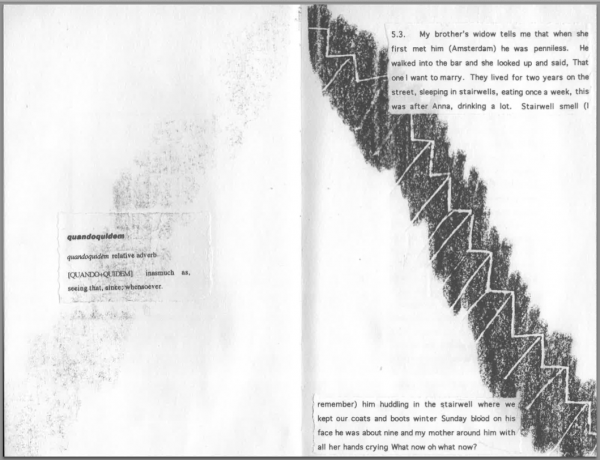 Sebald’s way around this was to keep to low-resolution, often multiply reproduced black and white images. When he reproduces tickets and other documents in Rings of Saturn they are minimally legible as physical objects, and when he reproduces photographs they are usually shown without borders or frames, so they are part of the printed book rather than objects displayed in the book. Tan Lin is most extreme in this regard: aside from the fact that it’s possible to look at his work in pdfs and zoom in to see signs of physical wear, he reproduces objects (including texts and photographs) very small, with a narrow value range, so we can hardly see how worn or stained they might be. As an envoi I will note that Nox has an extremely strange psychology. We learn that Carson’s brother hardly talked to his family, and didn’t even contact her until six months after their mother died. It’s clear her brother wanted to live his own life—he went years without sending a letter—but it is entirely unclear why she talked so little to him when she had the chance; and nothing is said about her way of talking to her mother. If Nox were limited to the numbered sections, which tell the family’s story, it would be an odd book, with one of recent literature’s least reliable narrators. (How can a reader not infer there’s another side to the story?) The addition of the extensive dictionary entries makes the project even stranger: it’s fairly clear in Nox that the author buries her mourning in philology, but it’s not at all clear how much she realizes that makes it appear she’s avoiding or repressing a fuller encounter. 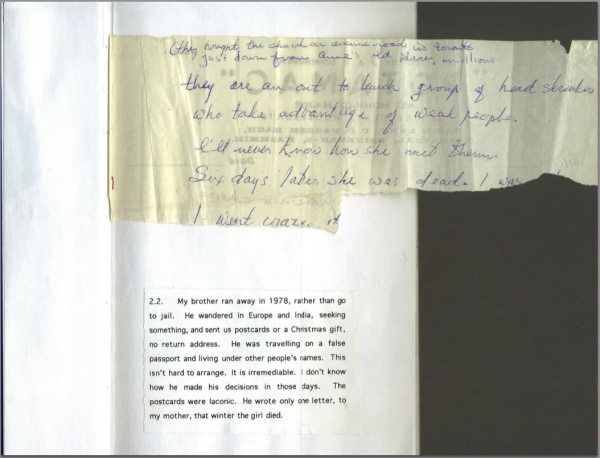 It is odd in the extreme that it seems the half-dozen memories reported in the book are enough to explore the issues and meaning of her brother’s place in the family. The book is, I think, psychologically skeletal and bizarre. But this only intersects the theme of writing with images when a few images (the letter, two photographs, a repeated shadow, a couple of cartoon figures) are made to stand in for the brother. If I knew that the author knew how shrunken and abbreviated her own exploration is, and how unaccountable it might appear to a reader who might well expect a fuller meditation (even if it is inconclusive, even if the evidence is in tatters), then I might be more inclined to take the images seriously, and look at them longer, and care about them more. Thanks for this. I haven’t been able to see a copy and appreciate your close description of the physicality of the book. I shouldn’t really say a word not having read the book, but I think that the idea of elegy and portraiture/love poetry in literature being a reduction and even exploitation of the subject is relevant. How to elegise without self-glorification and how to account for a life without narrowing, defining, deadening? The scraps here seem to me to underline that a memorialising work of art is, by its nature, an incomplete and radically imperfect gesture.